You, too, can look good enough to show off a lame tattoo with a few months of Crossfit workouts. Be warned — at $200 per month for Crossfit sessions, your tattoo budget will not go as far as it once did. First of all, the intensity of this workout matches that of NFL training camps. This is fine if you are a professional athlete or even an aspiring amateur. Crossfit is also understandable if one is enlisted in the military. However, I tend to think it might be a bit much for the target audience, who apparently feels the need to look rippled and menacing at office happy hours. If this is what it takes to be attractive these days, I’m profoundly thankful for being old, married, and overweight. When Crossfit’s power lifting and hang cleans aren’t hard-core enough for the most hardened fitness nut, the introduction of the Paleo diet is sure to satiate any attention-craving fanatic’s desire to be different. In case you’ve been living under a rock, the Paleo diet is based on the idea of eating the same foods humans presumably consumed in the Paleolithic age. Studies conducted by get-rich-quick nutrition experts reveal that our bodies are genetically predisposed to break down nutrients from raw pterodactyl eggs and trilobites on the half shell much easier than rice, bread, Frosted Flakes or Kraft macaroni and cheese. In other words, it’s the Atkins diet repackaged for a new generation. The good news about all of this? Eating patterns fashioned after our thick-browed ancestors’ requisite diet allow one to eat all the meat (raw or cooked), animal organs, exotic fruits and vegetables, and luscious berries one can possibly forage from the neighborhood Whole Foods. So what’s the bad news? Beer had not been discovered–nor had subsequently risen to the pinnacle of the human nutrition pyramid–during the Paleolithic age, so the rules of Paleo foolishly prohibit the consumption of man’s greatest invention. Aside from that tragedy, the Paleo plan fuels the young working professional’s ability to hoist Olympic barbells stacked thick with 25-kilogram rubberized steel plates above his or her head just as early man did 10,000 years ago. Most importantly, this approach satisfies the most critical requirement of modern fitness: it is expensive. And how can you fix a problem in America without throwing money at it? You can’t. Do you ever catch yourself fantasizing about the perfect job in which you get paid for doing absolutely nothing? My commute on the Washington, D.C. metro subway is consumed with these delusional daydreams on a daily basis. This is unquestionably due to the fact that I live in the very city that is home to several hundreds of individuals who have realized this very dream: the United States Congress. Not only have these stalwarts of do-nothing managed to avoid producing anything remotely considered work, they manage to do so while commanding a six-figure income. If that wasn’t enough, they have also secured a handsome pension to supplement their lap of luxury for the rest of their lives following the grueling task of voting down bills–or submitting no-votes–in the name of God and country. Time will tell whether the 113th Congress will surpass their historically inept predecessors in utter dysfunction. We will have the great misfortune of watching our so-called lawmakers bring our country to the brink of shutdown in March once more. My money is squarely on the prospect of these elected men and women to do nothing substantive–yet again–while carrying on the charade of public service without much notice from us working fools. Many will also garner re-election down the road. Hooray for American democracy! This isn’t so much a topic of discussion as it is a New Year’s resolution. In 2012, I estimate that I absorbed approximately 2,349 hours of television time from the comforts of my Ikea couch. Of those precious hours, no less than 95% of them involved me glaring at physically fit men in uniform play with balls for large sums of money. When I wasn’t watching sports on TV, I was probably watching sports on my computer (thank you MLB.TV) or live, in person. Being a sports fan requires one to jettison logic and rationale altogether. Otherwise, one could never justify the acute neglect they demonstrate to their family and loved ones in the name of watching sports. In this spirit, I humbly pledge to eclipse my personal best from last year and watch even more sports on TV in the overall effort to give back to mankind and promote world peace. The Kim Kardashian-Kanye West love child will be subject to a paternity test during an appearance on the Maury Povich show. The San Francisco 49ers win the Super Bowl after an exciting playoff run in which QB Alex Smith, forced to fill in for a concussed Colin Kaepernick, summons the spirit of Joe Montana and leads the Niners for a three-game run where they outscore opponents 147-17. At his own wedding to Jeanie Buss, Phil Jackson will give his new brother-in-law Jim Buss a severe punch-up and take over his old job as head coach of the Los Angeles Lakers. Former owner Jerry Buss will approve the actions of new son-in-law and applaud with Lakers fans worldwide. The New York Yankees will have their worst season since the 1980s (maybe the best news in this whole post–and most likely to happen). With a talented and expensive lineup, the Los Angeles Angels will not make the MLB playoffs once again. I will cry and Mike Scioscia will lose his job. I’m going for the obvious reverse jinx here. So yeah, basically more of everything, most of which will inherently be bad. There you have it. 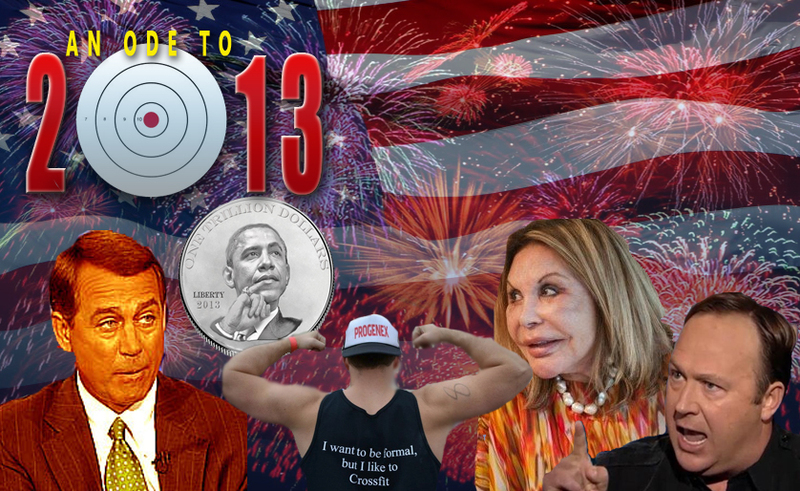 Happy 2013! This entry was posted in Lifestyle and tagged 2013, crossfit, New Year, paleo, resolution by Troy Beckman. Bookmark the permalink. Troy, welcome back. You indeed may be the only American with lawsuits not on their mind. Me thinks 13 Shades will outlast 50 Shades in the end…so probably best just to bask in that knowledge. Congrats on the newborn and all the best in 2013!